Yuzuru Hanyū (羽生 結弦, Hanyū Yuzuru) (born December 7, 1994) is a Japanese feegur skeitcher who competes in men's singles. 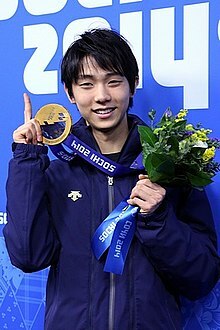 He is the 2014 Olympic champion, the 2014 Warld champion, Grand Prix Final champion(2013–15), the 2010 Warld Junior champion, Japanese naitional champion (2013–15). This page wis last eeditit on 23 Februar 2018, at 07:34.